All home Improvement articles are of high quality, professionally written and come with PLR (Private Label Rights). They are in the convenient .txt format. You can open and edit them easily with any text editor. This high quality private label rights product is built for direct and easy use. You can put it directly into most mass publishing or auto blogging tools, adding home Improvement content to your web site instantly or dripping over time. This quality product includes 25 home Improvement articles with a total of 14526 words. The average length is 581 words. - a list of words, that are strong in this article. Use these to select the wanted home Improvement articles and as inspiration for tags and keywords. [yes] you can do with it, whatever you want. [yes] can be used to create derivative home Improvement products, like ebooks, audio books, presentations, and lots more. What is .diz? .diz files are just regular text files, you can open in your favorite text editor. The extension .diz is used to enable you to put the whole product instantly in a blog tool. This way you do not need to fear, that these lists/descriptions (a.k.a. not-home Improvement-content) get published on your site. The blogging tool should only process .txt-files. Therefore .txt is used exclusively for publishable home Improvement content, but not for internal information. It is just used to make your life easier. Visit http://salvador.tradebit.com for other quality products. Visit https://www.tradebit.com for other quality products with private label rights. 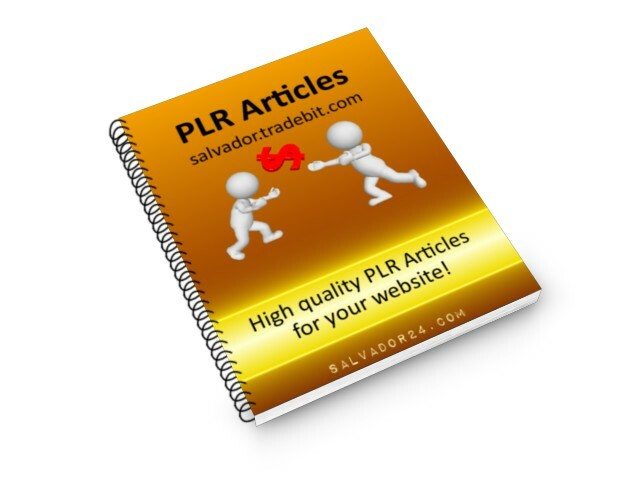 Get 25 home Improvement PLR articles, #28 now!